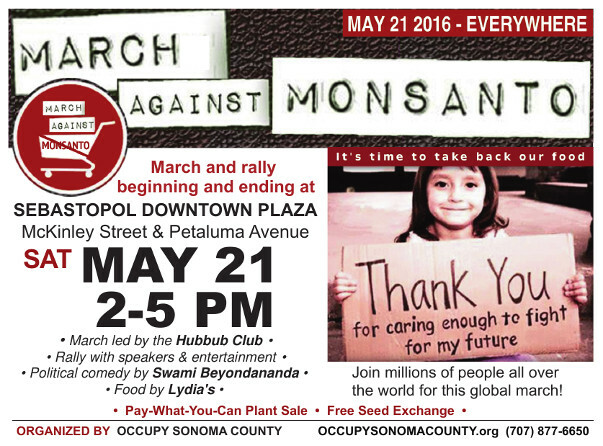 SEBASTOPOL, CA – On Saturday, May 21, 2-5 PM, residents of Sonoma County will join millions of concerned individuals gathering across 38 countries and 428 cities in peaceful protest against the Monsanto Company as part of the March Against Monsanto (MAM) grassroots campaign. This movement seeks to raise awareness to the dangers surrounding Monsanto’s genetically modified seeds/crops and cancer-linked herbicide Roundup. GMOs (genetically modified organisms) were introduced into the food supply in the mid-1990s by Monsanto. Due to health, environment, and inadequate testing concerns, GM foods are currently either labeled or banned in 64 countries--yet there is no requirement to identify them at all in foods sold in the U.S. due to the revolving door of Monsanto's corporate control at the Food & Drug Administration. This year's MAM comes as the demand for GMO labeling and non-GMO food alternatives continues its exponential climb, with states like Vermont enacting mandatory GM labeling legislation (effective July 1, 2016) that will require food corporations to let consumers know if their products contain GM ingredients. In polls conducted by the New York Times, Washington Post, Consumer Reports, and many others, over 90% of respondents were in support of mandatory GMO labeling. This has sparked several popular state ballot initiatives that have been narrowly defeated after Monsanto and other powerful pro-biotech interests spent millions to fight the measures. “There’s no question that March Against Monsanto is the most powerful grassroots initiative we have in the fight to reclaim our food supply from the GMO seed juggernaut known as the Monsanto Company,” said Anthony Gucciardi, MAM speaker and founder of the natural health website NaturalSociety.com. Despite claims by the multinational biotech giant that genetically modified crops would actually lead to a decrease in Roundup use, U.S. Geological Survey data reveals the use of Roundup’s key component glyphosate has increased 16-fold since the mid-1990s when GMO crops were first introduced. We March Against Monsanto here in Sonoma County to stop this destruction. "At Occupy Sonoma County, our primary aim is to educate the public about the hazards of eating GMOs. We don't need labeling to get GMOs out of food. When people learn about GMOs they no longer want to buy them which is evidenced by the growing number of major corporations that are removing GMOs from their foods," said Occupy activist and concerned mother Stephana Morales. The May 21st March Against Monsanto in Sebastopol begins at the Sebastopol Downtown Plaza at 2 PM followed by a rally with speakers and entertainment. For more information on this event or to learn about other local events hosted by Occupy Sonoma County, please visit http://OccupySonomaCounty.org or call 707-877-6650. For a complete list of MAM events and for up-to-date reporting on the global MAM, please visit http://www.march-against-monsanto.com/may21/. For the latest information, please contact us or phone 707-877-6650.